Looking back at the first installment in the Paranormal Activity franchise, it’s difficult to comprehend how we got to where we are now. Aside from the third film, I’ve found that the financial success of this series has come at the cost of innovative filmmaking. Little bits of a larger mythology have been introduced as this series has continued over the years. The hackneyed manner of doing so makes me question whether or not this was originally conceived as a franchise. This whole concept of creating an expansive mystical universe clashes with the repetitive nature of this series. By repeating the same exact style of producing scares, the horror has become predictable and ultimately nonexistent. 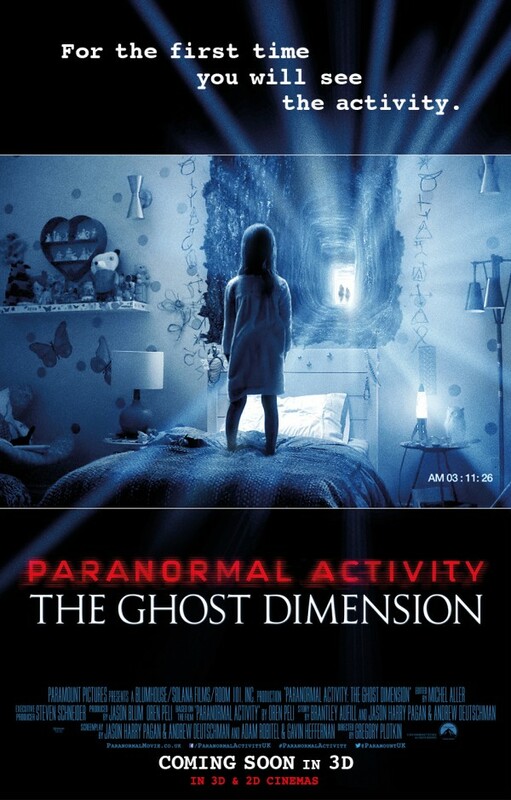 The latest film in this series, Paranormal Activity: The Ghost Dimension, hits creative rock bottom. Nothing occurs in this film that cannot be seen coming from a mile away. The absence of legitimate suspense creates an atmosphere of unintentional comedy throughout. There’s no reason to care about these characters since the movie follows the same tired formula of prior entries. It also commits an egregious sin by tacking on the unnecessary gimmick of 3-D to the equation. If you add up all the elements, you get the cinematic equivalent of attempting to run a marathon barefoot. The painful and sluggish journey makes the final destination all the more frustrating to reach. The last few minutes felt like I had crawled to the finish line only to be swiftly kicked into a concussed state. It’s not worth either my time or yours to give a detailed plot synopsis. To be frank, this film doesn’t warrant one. Here’s the story in a nutshell. Yet another uninteresting family moves into a suburban California home. 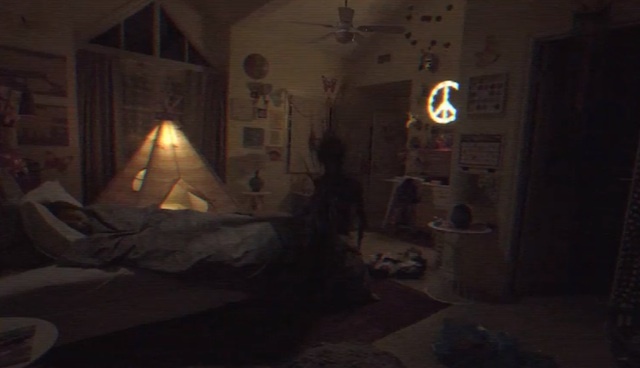 Dad discovers a set of old video tapes and a camera that seemingly captures spiritual occurrences within their new home. Their daughter begins to act strangely and forms a connection with a mysterious “Toby”, which is a name fans of this series are familiar with. They realize something is wrong with their surroundings and they do everything they can to keep themselves safe. This series has not had an abundance of intellectual characters. However, idiocy is taken to the next level by this new family. 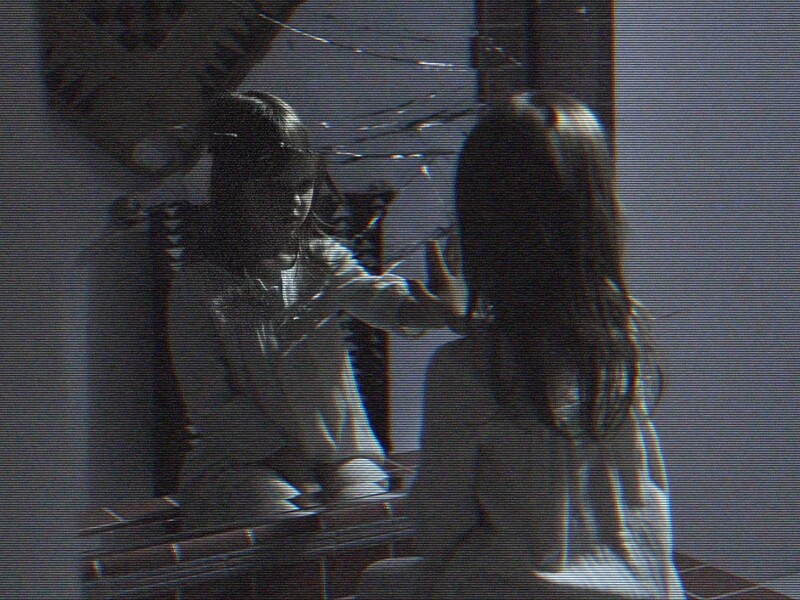 Early on, ghostly antics are captured on tape but the characters never watch the footage. The parents quickly realize that something is wrong with their daughter. Her antics are tropes you’ve frequently seen if you’re a horror fan. She buries rosaries in the backyard, attempts to burn pages of a Bible, and draws satanic symbols on the wall of her bedroom. Even with all of these occurrences, the husband STILL has to convince himself that he’s not just going crazy. 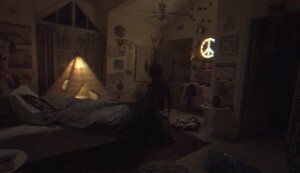 They don’t even do something as simple as painting over the symbols or moving their daughter to another room. When she is in grave danger, it’s way too implausible for me to believe they’d continuously carry around the camera. The characters in this film possess no inherent survival skills or even a fragment of common sense. Much of the unintentional comedy is derived from the unrealistic actions taken by the characters. The utilization of 3-D is nothing more than a marketing tool. For some inexplicable reason, the 3-D is only used when the characters are carrying the aforementioned camera. I guess it’s fitting that this series adds yet another cheap gimmick to the assortment used throughout the duration of this series. The 3-D also makes parts of the film literally unwatchable. The camera is used mainly at night, therefore it’s already a darkly lit film. The 3-D just makes it that much darker and there are instances where I had difficulty seeing. Then again, it wasn’t scary even when I could see what was happening. The effects seen through the camera look as if they were given minimal attention by the effects department. Visually, it looks too much like an assimilated iteration of the black ooze from Prometheus. The dimension by which this film gains its title from is uninteresting to say the least. There’s no great secret as to what it is even if you haven’t seen the poster. When time is finally given to its explanation, it’s rushed and comes out of nowhere. By viewing the tapes left by the prior owners, the characters exonerate all of the mystique from how the dimension is being used. By the time we get to the concluding minutes, the film leaves us with more questions than it bothers to answers. The last scene by the way, is a complete “screw you” on the part of the filmmakers. They’ve stated this is the final entry in this franchise. I wouldn’t know that based on how much is left unexplained and how little is properly concluded. I can’t spoil perhaps my biggest problem with the film, the absence of a major plot element through this series, for the sake of professionalism. It falls in line with what I said about how little is given a proper conclusion. There’s a certain element that has carried through all of these films that is never seen or addressed. I can tell you that I was angered by its absence and the lack of resolution explaining it. I vehemently disliked this film all the way through but this pushed me into seething fury. 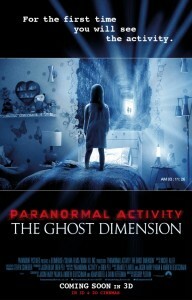 As a Paranormal Activity film, it’s easily the most insufferable. As a finale, it’s inconclusive and a slap in the face. Previous ArticleTV Review: Survivor: Cambodia – Second Chance (31X05) "A Snake in the Grass"